Notes: Developed by Mike Mercer of Redding, CA in the early 1990's. Golden Stone nymphs are smaller and lighter in color than salmonflies. They also have a flatter body profile. The belly's are a rich golden color while the dorsal portion is usually dark. The abdomens have distinct bands and the legs are heavy and bulky. Mike was able to get the flattened body profile by utilizing two strands of lead wire along the shank and wrapping a third strand around the thorax region, gently mashing it down into a planar shape. The Poxyback, Golden Stone utilizes a dubbed abdomen which is teased out to represent the thin appendages of the actual insect. Mike has since refined his pattern variation with the BH Poxyback, Biot Golden Stone in which turkey biots represent the abdomen in a more realistic way. The biots produces a naturally ribbed segmentation appearance and the Turkey Biot's are thin enough to represent the whip-like tails and antennae. 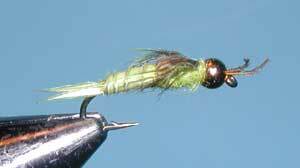 Stoneflies like freestone streams. 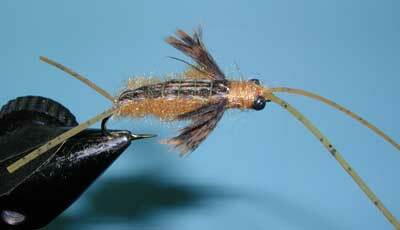 During late May and June, the golden stoneflies will crawl along the bottom to reach shore. Trout will often locate themselves close to shore to intercept the stoneflies while staying in the edges of pockets and slots. A drift-free presentation of the nymph within the feeding lanes will produce results. Depending upon the water, some use indicators while others prefer to high-stick nymph without indicators.